I’ve heard from some people who don’t like to travel as much as you and I that foreign foods are one reason they prefer to stay home. And although there’s nothing at all that would keep me at home, I can see where they’re coming from. If you don’t have adventurous taste buds, then travelling to other countries and cultures can be daunting at times. I’m not the most adventurous eater around – I grew up mostly vegetarian which limits things for a start – and I can’t handle extreme spice either – although I’m getting better, slowly! But if you feel worried about food, don’t make it a reason not to travel. 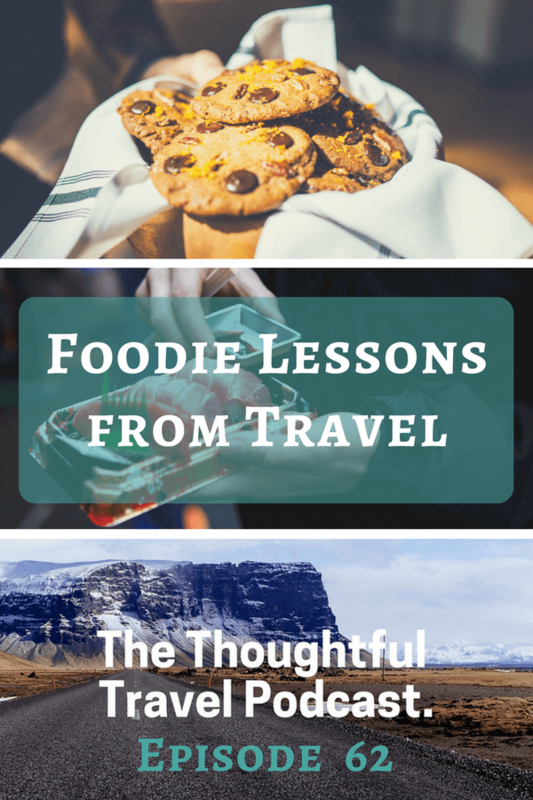 Do some research ahead of your trip, pack a few muesli bars, and listen to this podcast episode about foodie lessons from travel and take off! Who doesn’t love exploring new cuisines on their travels? I’m always keen to set my taste buds loose on some new foods but as my guests and I discuss in Episode 62 of The Thoughtful Travel Podcast, it’s not just about the taste buds: foods in other countries can also teach us a lot. In this episode I start by chatting with Alicia Nelson who learnt some foodie lessons on her travels in Spain and Japan. Following that, Zoë Dawes tells me some interesting tales about foodie lessons she learnt in Hong Kong and beyond and we chat about how polite we should be when we’re offered new and unusual foods. Finally, my favourite foodie guest ever, Yasmin Newman, talks to me about her food sabbaticals, and particularly her most recent one in New York when she spent three months eating desserts pretty much non-stop. Interestingly, the biggest lesson to take away from this one is not only foodie-related but a bigger life lesson. Thanks for your lovely contribution Zoë! Loved being able to put all these wise words about food together.